… or the Fallacy of the Mimetic Notion? Much has been said about the various degrees of digital editing in landscape photography since the inception of photoshop, gimp and the likes. But recently the debate has gained a new unparalleled ferocity up to the point where different voices sound almost like religious zealots defending their positions. My stake on things is basically that each should use it to his or her liking. But if I don’t want to make a case for either side, situating myself in the middle of this often binary opposition, what am I writing this for you may ask? The first argument I want to make is a plea for not only seeing it as a schismatic dichotomy which favors one over the other. When people look at my images they often ask me how much of it is real, well aware of the fact that I do some post-processing. But they never know how much and this is the key argument. 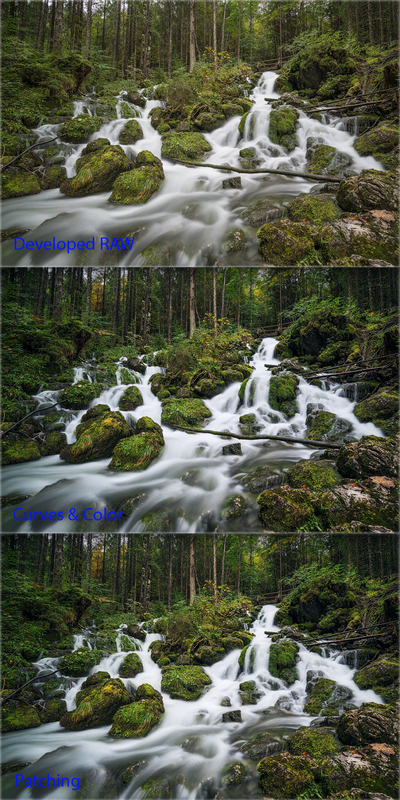 Sometimes I only do some color and contrast fixes and that is it; sometimes I capitalize on a certain aspect of an image – let’s say it’s the dreamy light, and I might end up exaggerating it with massive dodge and burn renditions, Orton effect, and post-sharpening. And I don’t fear to say this: I have even removed disturbing elements from my compositions – branches, leaves, people you name it. This of course states the question how much is too much, and I say that there is no answer and I tend towards defending the artistic vision of the pictures I have taken. And rather as treating them as photographs or pictures I often see them as images; notice the entailed semantic differences here. In this case I wanted to demonstrate a rather minor change to the image. Since I found the fallen timber too distracting, I decided to simply remove it from the shot. Ultimately though, I never posted this shot, not being content with the outcome. Now, many artists defend their artistic expression that way, I am, by far, not the only one. However after spending years following all sorts of photographers, ranging from the one side of the continuum – the purists who only apply minimal, if at all any editing to their shots – to the other side – the light painters or neo-luminists and composers who add people on cliffs, stretch mountains, or completely replace the sky, or create completely artificial landscapes from multiple shots, I became aware of increasing disputes. Over time I noticed that one of the central aspects of this dispute is actually revealing the amount of post work that has gone into an image in the enclosed description. There seems to be constant yearning to know about the authenticity (much like with any ‚realist‘ or ‚mimetic‘ medium) and whilst I can relate to that it often seems to be related to a certain anxiety lying beneath this. Here an example for very extreme editing for my standards. I cleaned up the rocks and used some quite heavy dodge and burn renditions to get the image that I wanted. This is not usually the way I go, but in this case I had to in order to achieve the pre-visualized outcome I had in my mind before even arriving on location. – Note that I use the neutral setting for the OOC jpgs! In modern and post-modern society the loss of authenticity an truth seems to be one of the central motifs which conjure this nostalgia, simpler times when one did not have to suspect treachery behind every commercial, news article and photo. I can very much ascribe to that notion. Especially in the context of modern landscape photography. „At the moment people will look at a photo and believe it, then find out later that it has been faked. Then they will look at another photo, believe it, and then find out it has been faked. It will continue in this way until people start questioning an image first and believing it second. Then eventually people will start to assume that fantastic images are not real at all“*. So there is the ideological assumption that the mimetic quality is at the heart of the medium still gradually deteriorating with each image that is fake. This ideal of the adequate representation of reality is phenomenologically flawed however. The base question beneath this debate is whether there is indeed a mimetic quality to the medium of photography at all. The conclusion might ultimately be that any type of framing, detaching a part of reality, from its context, is an alteration of the natural environment. This is happening because in the viewers mind -as much as in the photographer who frames a shot – following a kind of pars pro toto logic, the frame is extended and narrative connections beyond it are made. Following this train of thought there is no mimetic ontology behind photography. Arguably photography itself is already a form of abstraction already. A stream flowing into the Atlantic near Praia Grande on a rather cold and still evening. When I came back one year later it was almost gone due to a dry and even colder winter. 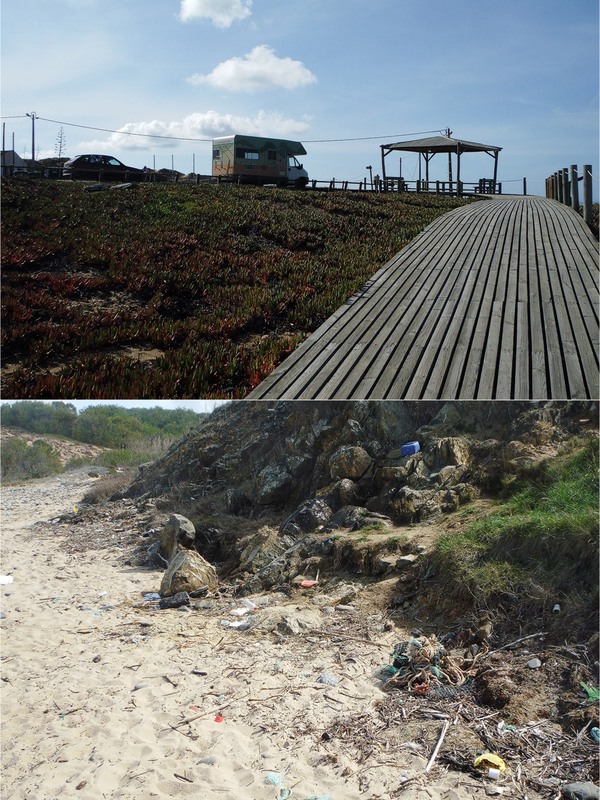 What you see here are two mobile pictures taken along the patch to the beach the picture above was taken at. Set in this new context I assume that you may not find the shot above as tranquil and endearing knowing that only 20 meters away the washed up trash was lying on the beach and another 500m away was a parking lot. That’s exactly what the frame extension in your head is compensating (that is if you don’t know the scenery of course). Furthermore I have the thought that many feel like it is a skewing of the art when the shift from in-camera to the post-work side of the craft continues. Instead of actually placing someone of a cliff which requires communication and sometimes life threatening actions, it is easier to make believe someone stood there, inspiring awe and bewilderment in the viewer, thus strengthening the impact of the image. Furthermore rather than waiting 4 days at a spot for the right light, painting it in seems way easier. All these stressful experiences however somehow are attached to an image. For me as a photographer some images are personally more endearing as others just because I know how much effort went into taking them as opposed to those that were made in lets say an urban environment and required only minimal effort. Not climbing up a mountain or driving 2000km, but only 50km and a 5 minute walk. Augmenting reality always comes with a loss of aspiration and it’s not always a compromise I am willing to take. If a shot just doesn’t work out I cut my losses and head home, contemplating whether I should return rather than sitting hours in post and fixing what just wasn’t there. For me it does taint the experience for the most part, although I do post processing to some shots to see what I could get out of them. 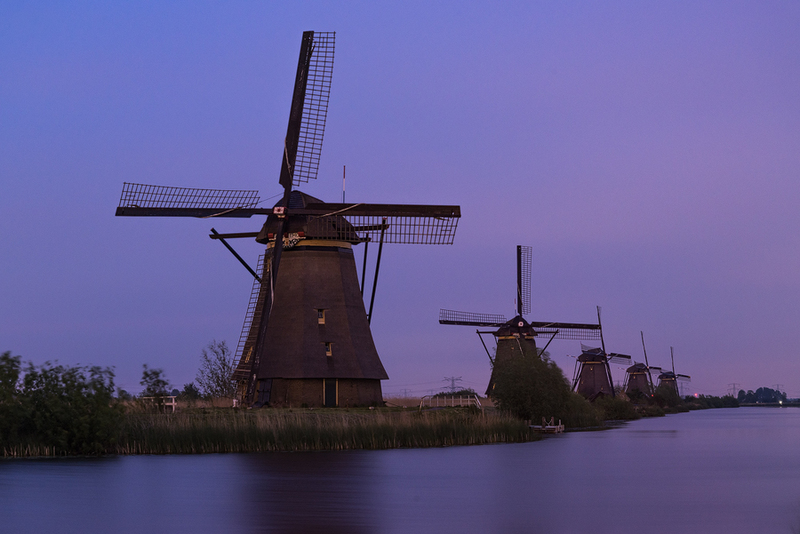 Here I drove several hours to Kinderdijk to shoot the blue hour, due to the overcast sky it didn’t work out.. 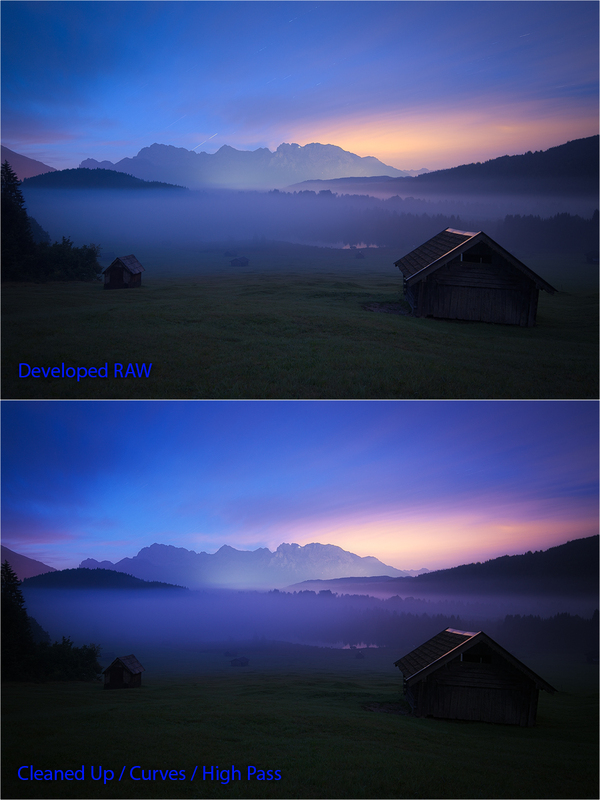 So I never released any shots (this blog being the exception) – I developed the RAW just for this blog entry. This shot might be a another good illustration. 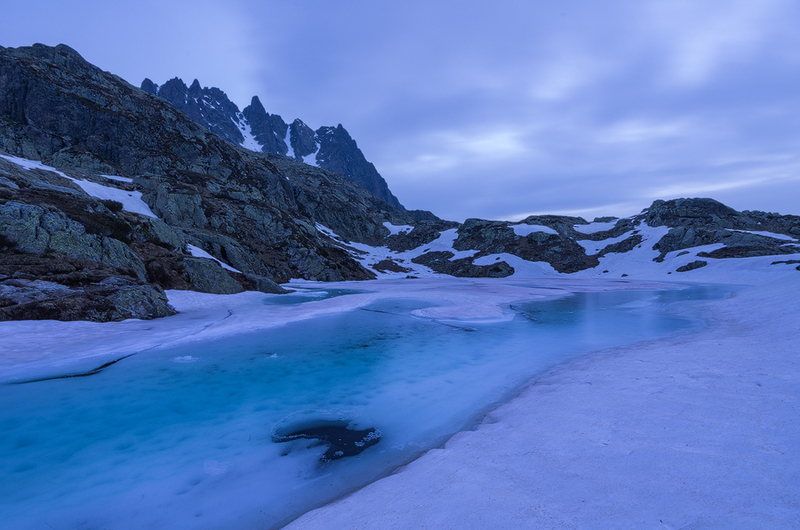 During my third visit to Lac de Chesery the light just wasn’t great while I was there. What you see here is a developed RAW I didn’t even bother to put more work into it because it just wasn’t worth it and also didn’t feel right to me to make up for it in post (and in this case even the composition is sub-standard). The human eye is drawn to contrasts, as we use it for our cognitive patterns gathering visual information, thus harsh contrast and strong colors attract the gaze which is why heavily edited shots probably get more attention. Conclusively next to a realist image, the neo-luminist will most likely draw more attention, it’s the sad truth, or clever intention by the artist, depending on your point of view. Another, and actually one of the most important factors, that is often omitted in this debate is the economic side. First off I want you to keep in mind that landscape photography is an extremely overpopulated field of work, so for many it is hard to make a living, and light which is the base of every single landscape shot is a moody mistress, yet the need for good light is all-encompassing. Hypothetically someone spends 2000€ to fly to a location and ends up having horrible conditions but still is depended on bringing home good shots to pay his bills – the temptation to make up for the lack of good conditions in post-work seems irresistible, almost a necessity, because a potential client can get his images of the subject he needs somewhere else easily, simply because there are is multitude of other photographers who have already shot the location and did get the great light our hypothesized pro came for. This is one of my best shots in recent times. I drove about 800 kilometers just to witness the moon rise behind the mountains that evening (of course I also hoped for alpenglow). I was lucky that the timing was perfect and so were the clouds. This shot alone might have been worth at least 150€ of gas alone. – Note that I use the neutral settings for the OOC jpgs. The trend might find parts of its origin in these simple economic drives. While I do not at all want to claim that this is the case for many, I do believe this is true for some. One of the tell-tale signs are the many costly tutorials for sale by different photographers – so there seems to be a big market there (to be honest even I bought some tutorials and I think it’s a good thing to get different techniques down; just don’t start mindlessly copying others). On the other side we could also see the post-work increase as a great democratizing process beneficial for the geographically disadvantaged. I’ve seen images with replaced skies almost on a daily basis the last years. Sometimes the milky way was placed over mountain scenery or a big city (something impossible because of the light pollution) maybe even northern lights over Paris. I assume many go to great lengths to manipulate their images because they simply don’t get to live on the Lofoten Islands, Iceland or the Pacific North West, but would love to be able to shoot such conditions, making up for the inability in post. Somehow my ideology keeps me from doing that, but I myself am one of these persons as you may have read in the dp-review interview I’ve given*. Of course this is all at the expense of those who’re neither skilled enough to work efficiently in Photoshop or other editing software nor live amidst breathtaking vistas or for ideological reasons refrain from post work. Gladly for me I don’t have to make a living selling images or tutorials, so I can still work outside the recent economical shackles of post-work. The fast changing perceptional modalities of the audience are deadening ever more slightly with the consumption of those hyper-realist or surrealist visual modes, just like the overall mental dilapidation through mind-numbing reality tv-shows. While this is not a completely accurate metaphor I suppose that in the future the number of photographers founding their work more on the post processing side will increase as the attention market online gives them the spotlight. For some this maybe a dire premonition, but when we look at the grand scheme of the art realm such trends have been coming and going for the last 400 years when it comes to landscape representations. The question is when the movement will find it’s zenith and recede. Also aside all the neo-luminist there are photographers who make a living and get attention for works that are ’seemingly unaltered‘ or only to a small degree and don’t even display the most impressive sights our planet has to offer. The reason being that they present a coherent art-style which is not so much defined by the question of how much post work or not but what story the image has to tell – a good example are some of the by Kilian Schönberger like his Brothers Grimm series*. So rather than spending time thinking about how much post should go into an image it is important to think about what you want the image to emotionally convey to the audience. A giant fake moon often draws attention to itself and thus makes it blatantly obvious that the authentic nature of the medium was not maintained, is that an effect you want to have? Yes? No? Ok, good then think about what this means for your audiences and yourself. The same can be said about any other editing you do and how it affects the representational power of the medium. In the end it’s never about the amount that goes into it but what comes out of it. Here you can see that sometimes I do minimal, if at all any editing. In this case the visual story didn’t need any further editing at all. The evoked emotions are completely sufficient in my opinion to leave a lasting impact on the viewer. I think merely think of post-processing like a tool similar to my camera which already alters reality by severing a moment out of time, just like I do by framing, deciding what goes into the picture and what is omitted. If we assume that there never was a mimetic quality and that it has been a fallacy from the beginning, the debate somehow loses a part of its discord. We can see this approach to photography in other disciplines like architecture or fashion photography. No one seems to be complaining that the sky is replaced in an architecture shot, or that the contrasts are boosted and details removed so the contouring remains dominant. While I do think that the argument to keep landscape photography pure and realist is noble and desirable, I feel like it is amongst other reasoning driven by nostalgia and ill-rooted in a romanticized idea of the supposed mimetic nature of the medium. I may seem to some now as an advocate for the post-work side of the equation, but I feel more like an mediator to be honest. Someone wants to break up the binary opposition at least a little for people to see the interesting parts in between the extreme ends. I hope this text was able to maybe give a new impulse of thought to some who are concerning themselves with the topic. 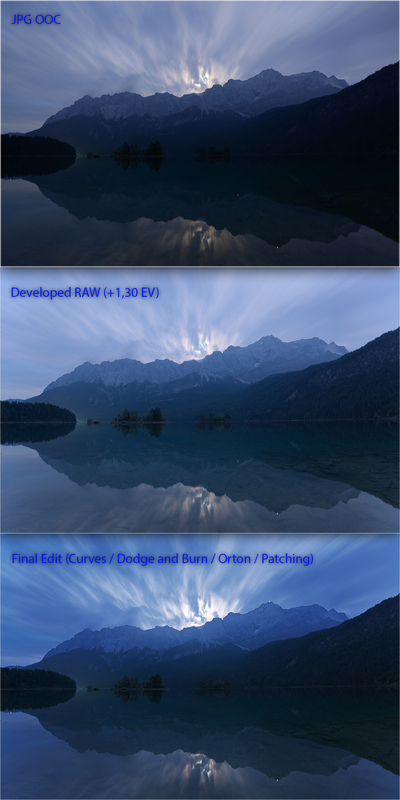 Anyway these were just my two cents on the post work in landscape photography.